Image caption The graduations are over but which are the best universities for job hunters? What's the best university name in the world to put on a job application? It's the Massachusetts Institute of Technology (MIT) in the US, according to an international league table for how much universities are likely to boost the future careers of graduates. The Graduate Employability Rankings, based on the views of 42,000 employers, shows the universities most likely to impress graduate recruiters. The league table is produced by the QS group that publishes the annual World University Rankings - and reflects that students are considering future job prospects as well as academic achievement. Employers were asked where they recruit their most "competent, innovative and effective" graduates. The rankings also take into account employment statistics for former students, where high-flying graduates in top jobs studied and the range of partnerships between universities and employers. 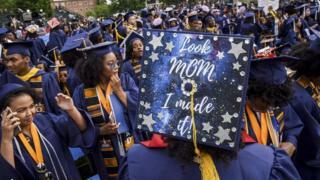 US universities take the top four places, with MIT, Stanford, University of California, Los Angeles (UCLA), and Harvard, whose graduates are seen as the most sought after. MIT is known for its high status in technology and innovation and can claim former students such as the astronaut Buzz Aldrin, former UN secretary-general Kofi Annan who died last month, and Amar Bose, the sound engineer and billionaire founder of the audio equipment firm. Stanford, in second place, has been the academic cradle of much Silicon Valley technology research, with former students including Google founders Larry Page and Sergey Brin and Netflix founder Reed Hastings. This league table shows Australia's rise in employability, with the University of Sydney and the University of Melbourne in fifth and sixth places. Neither university is in the top 30 in the equivalent academic league table, the World University Rankings, but they are seen as high-flyers for the jobs market. Ben Sowter, research director at QS, said that universities which have big global research reputations are not necessarily "those that do most to nurture student employability". He said that the cost of tuition fees and a competitive jobs market meant that students were increasingly "concerned about the likelihood that their prospective university will help them thrive afterwards". Cambridge is the highest UK-ranked university in seventh place, with Oxford in 10th. University College London is in 18th place. On the strength of their reputations with employers, Cambridge and Oxford were the highest rated. But UK universities slipped back on partnerships with employers and graduate employment rates. The economic rise of China is reflected in Tsinghua University taking ninth place and the University of Peking appears in 20th place. From the top 500 universities for employability, 102 are from Asia, catching up on 144 from Western Europe. The United States has 83 universities in the top 500, including 13 of the top 30.